Delicate gold necklace with round lapis stones in the center flower and on the sides of the chain. Only about 2" wide. Very small delicate gold flower earrings. Approximately 1/2" side. They are the same center flower as on the necklace but without the outside leaves. Heavy gold medallion with a round lapis in the center. Very "Celtic" design. Formal gold crown. 3-D band of golden 5-point flowers with small lapis centers. Eowyn wears 3 belts with her gowns. Some are worn with more than one outfit. Soft sectional belt of what looks like tooled leather, brass and long cords. 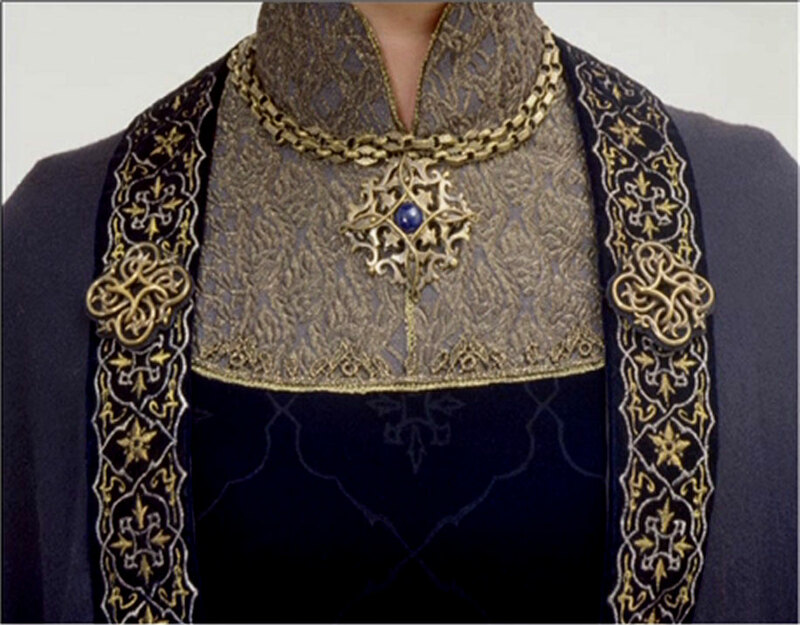 This is worn with both Eowyn's brown Beacon Gown and her Riding Outfit. Main belt is 1 1/2 to 2 inches wide.' Heavily tooled leather. Hangs slightly low in front. In place of a buckle, is cord and brass swirls. The large cast brass decorative swirls are reminiscing of a horseshoe with curly ends. The swirls are decorated with little crosses or "X"s.
The belt is "closed" in front with a brass swirl attached to each end of the main belt in front and a 3rd on the top of the belt tail. It looks like a leather cord forms pulls them into a triangle. We still do not know what the center "Tail" is made from. Speci is iether timed macramé cords or wooden beads or tooled leather pieces (but those would probably twist during shooting, so it's less likely.) The tail piece alternates light and medium brown. Each section is separated by a bigger gold bead. If anyone gets to see this belt in person, please, we need a more definite description. Shows main belt strap and some of the cast horseshoe ends.